Onyxia 10 man can be soloed by most classes. But it will be harder for some classes. After some experimenting i came up with a good tactic for rogues, even though they lack ranged damage. You must also be speced combat for the killing spree ability. When you first engage onyxia do not pop any of your cooldowns. Simply dps her down untill she gets into phase 2. Phase 2 is when she moves to one of the sides and flyes up in the air. Kill any whelps she summons and then wait untill she is at the top corner of her lair, that is important because it is the ONLY spot where you can reach her in the whole lair. Simply run up to her and pop all your offesinve cooldowns, "jump" and then time your killing spree so that you get "teleported" up to her. When you killing spree is done you should have done enough damage to get her down on the ground again. So after that just dps down the remaining health and collect your loot, and hopefully mount! The systems patch for Warlords of Draenor made many changes. This guide was written before the stat squish that makes high level characters flatten creatures in older content. You probably won't need to manage your Runic Power nearly so much. IMPORTANT NOTE FOR EVERYONE: Do not get Onyxia down to 1hp while she's in the air. It has a good chance of bugging the encounter (becomes unkillable). The trickiest part of fighting Onyxia is during her air phase. 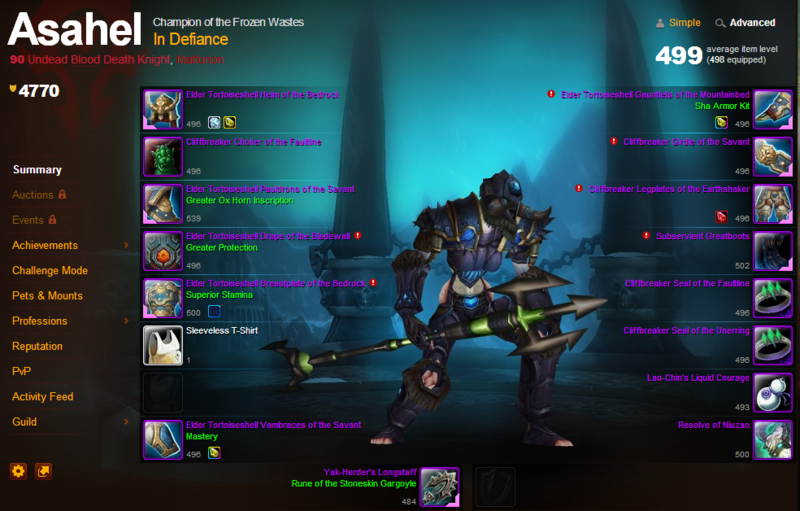 A DK has only two truly ranged attacks - Icy Touch and Death Coil. Outbreak (ranged but doesn't do direct damage) is helpful for getting the Blood Plague DoT applied as well as Frost Fever, but it's harder to do because Onyxia is only in range of it when she's near a wall. Do your best to keep Frost Fever ticking on the dragon, but be mindful of your available runes since you will be using Death Strike a lot. Use your DPS cool-downs at or shortly after initiating the fight. It's best to push her as low as possible before she gets into the air. Kill the wyrmkin soldiers but leave the whelplings alive. Kill whelplings as needed to maintain your DS absorb and gain runic power. Use the runic power to cast Death Coil at the boss. Follow Onyxia around as best you can, using Anti-Magic Shell when off CD to absorb her fireball and gain more runic regeneration. Kill the adds that remain just before or as she lands back on the ground. Particularly important if you don't have an item or ability (you DO have Lichborne as a talent, right...?) that breaks fear. Edit: Looted the Reins approximately on my 33rd kill. Don't give up, people!